Enriched air, Nitrox, EANx. What’s it all about? Do you want to grab more bottom time? Squeeze more dives into your day? Feel less fatigued? Then read on. What is Nitrox, EANx and Enriched Air? So what is Nitrox? In simple terms, it is a mixture of gas that contains nitrogen and oxygen. In fact, the very air that you are breathing right now is Nitrox, it contains 79% nitrogen and 21% oxygen. Nitrox can be any mix of nitrogen and oxygen. Enriched air is any mix of nitrogen and oxygen where the percentage of oxygen is greater than that found in air, i.e. greater than 21%. Put simply, the air is enriched with oxygen. EANx is an acronym that stands for Enriched Air Nitrox. Easy! What are the benefits of Nitrox diving? As any diver will know, it is the nitrogen in the gas that we breathe that tends to cause us the most problems. Nitrogen is of course known to instigate Decompression Sickness (“DCS” or the “Bends”). The science behind EANx is that if you increase the amount of oxygen in the breathing gas, you reduce the amount of nitrogen and therefore reduce a divers exposure to nitrogen. Reduced nitrogen absorption relative to air diving means longer bottom time via extended No Decompression Limits (NDL’s.) Reduced nitrogen absorption also serves to limit the chances of developing DCS, assuming conservative diving practices, such as slow ascents, safety stops and staying within the limits of your dive computer or tables are followed. It is a common misconception that when diving on EANx, you’ll get more from your tank. This is not the case, the tank lasts the same amount of time, but if you are good on your air, you’ll squeeze in more bottom time via your favourable NDL. Another great advantage of diving with EANx is that as you have less accumulated nitrogen in your body after diving, you feel less tired. 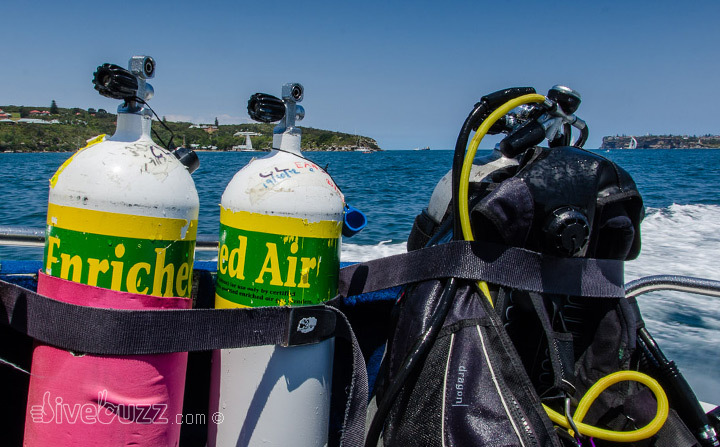 Great for dive trips where you are doing multiple dives in a day over multiple days. This all sounds too good to be true doesn’t it? But wait, there is a catch. There is a common misconception that diving on EANx is safer that diving on air. Quite frankly, it is no safer than air diving and can indeed be less safe if not conducted appropriately and without proper training. There are some key areas that need to be addressed in EANx diving. What’s the downside to using Enriched Air Nitrox? Oxygen becomes toxic at depth. Below the Maximum Operating Depth (“MOD”), the increased partial pressure of oxygen in EANx can lead to what is known as CNS Oxygen Toxicity. Symptoms for Oxygen Toxicity may include visual disturbances, ringing in the ears, nausea, twitching, irritability and dizziness. However, the most concerning symptom as a diver is sudden convulsions, without notice. Clearly convulsing underwater is undesirable: sudden convulsions, regulator spat out, lack of control, potentially game over. The more oxygen there is in the EANx, the shallower the MOD. At the recommended safe oxygen partial pressure (PP) of 1.4 times, the maximum allowable depth for normal air (21% Oxygen) would be 56m. But if you were diving on EANx 36%, for instance, this contrasts to a maximum allowable depth of 28m. Clearly, careful analysis of your EANx to check the mix and determine your MOD is vital. Also critical is sticking to your MOD – this may be easier said than done if your buoyancy is less than perfect, you are over weighted and perhaps diving on a deep wall. So how much more bottom time will it give me? Well, diving on air would give you an NDL of 20 minutes at 28m. But diving on a blend of 36% EANx would give you an NDL of 35 minutes at 28m. So, if you’re hanging out at a manta ray cleaning station at 28m, that’s another 15 minutes of possible manta action that you may miss out on by diving on air. Just remember – although it increases your bottom time, your air consumption remains the same. Over multiple dives, your body accumulates oxygen, as it does nitrogen and the other gases that you breathe. Given enough time, this accumulated oxygen can also become toxic. It is therefore important to monitor your oxygen exposure over any given 24 hour period. Nitrox compatible dive computers will track this for you assuming you programme them correctly with your EANx blend prior to each dive. If you are still feeling keen, sign up for an Enriched Air Diver course. Nitrox does after all have some great benefits, however, proper training and knowledge are vital to ensure that you dive safely on your EANx mix. Any credible dive centre will not allow you to dive on Nitrox without proof of proper training. So what are you waiting for? Dive in and experience the benefits of Enriched Air Nitrox for yourself. My buddy is an air pig! Dry Suit Diving - Dive without getting wet! Nice one Janine, very informative, see you out in the Coral Sea one day?